As we begin the countdown for a brand new year, our garden slates can feel empty. So here’s an easy tip for your own garden resolutions. Keep one ear to the earth. 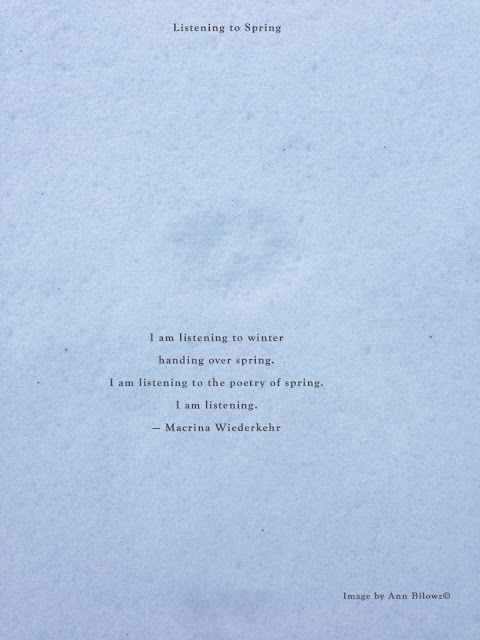 Listen to winter and you might actually hear spring. Underneath that snow, all may be dormant but a true garden lover instinctually, almost immediately learns to persevere. With one foot in the earth, regardless of the season, perseverance is faith in disguise. While we settle in and listen to winter, keep one foot in the earth. This 2013 blog season ends with my own homegrown ‘Annie’ quote and what any person who truly loves to garden learns. "With one foot in the earth, regardless of the season, perseverance is faith in disguise." If you like these daily posts, come listen to the seasons as we launch into a brand new year. Keep this as your place to be and don’t forget to share, comment, like and follow. That is if you want to be tuned into spring. Labels: Garden perseverance, listening to the seasons.